Micrograph showing an eosinophilic vasculitis consistent with Churg–Strauss syndrome. H&E stain. One of the American College of Rheumatology criteria for Churg–Strauss syndrome is extravascular eosinophil infiltration on biopsy. It usually manifests in three stages. The early (prodromal) stage is marked by airway inflammation; almost all patients experience asthma and/or allergic rhinitis. The second stage is characterized by abnormally high numbers of eosinophils (hypereosinophilia), which causes tissue damage, most commonly to the lungs and the digestive tract. The third stage consists of vasculitis, which can eventually lead to cell death and can be life-threatening. This condition is now called "eosinophilic granulomatosis with polyangiitis" to remove all eponyms from the vasculitides. To facilitate the transition, it was referred to as "eosinophilic granulomatosis with polyangiitis (Churg–Strauss)" for a period of time starting in 2012. Prior to this it was known as "Churg–Strauss syndrome", named after Drs. Jacob Churg and Lotte Strauss who, in 1951, first published about the syndrome using the term "allergic granulomatosis" to describe it. It is a type of systemic necrotizing vasculitis. Effective treatment of EGPA requires suppression of the immune system with medication. This is typically glucocorticoids, followed by other agents such as cyclophosphamide or azathioprine. Eosinophilic granulomatosis with polyangiitis consists of three stages, but not all patients develop all three stages or progress from one stage to the next in the same order; whereas some patients may develop severe or life-threatening complications such as gastrointestinal involvement and heart disease, some patients are only mildly affected, e.g. with skin lesions and nasal polyps. EGPA is consequently considered a highly variable condition in terms of its presentation and its course. The third and final stage, and hallmark of EGPA, is inflammation of the blood vessels, and the consequent reduction of blood flow to various organs and tissues. Local and systemic symptoms become more widespread and are compounded by new symptoms from the vasculitis. The most serious complication of the vasculitic stage is heart disease, which is the cause of nearly one-half of all deaths in patients with EGPA. Among heart disease-related deaths, the most usual cause is inflammation of the heart muscle caused by the high level of eosinophils, although some are deaths due to inflammation of the arteries that supply blood to the heart or pericardial tamponade. Kidney complications have been reported as being less common. Treatment for eosinophilic granulomatosis with polyangiitis includes glucocorticoids (such as prednisolone) and other immunosuppressive drugs (such as azathioprine and cyclophosphamide). In many cases, the disease can be put into a type of chemical remission through drug therapy, but the disease is chronic and lifelong. On December 12, 2017, the FDA approved mepolizumab, the first drug therapy specifically indicated for the treatment of eosinophilic granulomatosis with polyangiitis. Patients taking mepolizumab experienced a "significant improvement" in their symptoms. 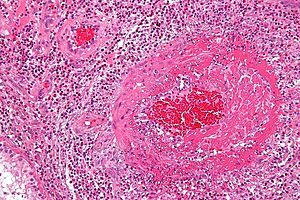 Eosinophilic granulomatosis with polyangiitis was first described by pathologists Jacob Churg (1910–2005) and Lotte Strauss (1913–1985) at Mount Sinai Hospital in New York City in 1951, using the term "allergic granulomatosis" to describe it. They reported "fever...hypereosinophilia, symptoms of cardiac failure, renal damage, and peripheral neuropathy, resulting from vascular embarrassment in various systems of organs" in a series of 13 patients with necrotizing vasculitis previously diagnosed as "periarteritis nodosa", accompanied by hypereosinophilia and severe asthma. Drs. Churg and Strauss noted three features which distinguished their patients from other patients with periarteritis nodosa but without asthma: necrotizing vasculitis, tissue eosinophilia, and extravascular granuloma. As a result, they proposed that these cases were evident of a different disease entity, which they referred to as "allergic granulomatosis and angiitis". The memoir Patient, by musician Ben Watt, deals with his experience with Churg–Strauss syndrome in 1992, and his recovery. Watt's case was unusual in that it mainly affected his gastrointestinal tract, leaving his lungs largely unaffected; this unusual presentation contributed to a delay in proper diagnosis. His treatment required the removal of 5 m (15 ft) of necrotized small intestine (about 75%), leaving him on a permanently restricted diet. Umaru Musa Yar'Adua, the president of Nigeria from 2007 to 2010, reportedly had EGPA and died in office of complications of the disease. DJ and author Charlie Gillett was diagnosed with EGPA in 2006; he died four years later. Japanese ski jumper Taku Takeuchi, who won the bronze medal in the team competition, has the disease and competed at the Sochi Olympics less than a month after being released from hospital treatment. New Zealand reporter and television presenter Toni Street was diagnosed with the condition in 2015. Street has had health problems for several years, including removal of her gallbladder four months prior. Willie Naulls died on November 22, 2018 in Laguna Niguel, California, from respiratory failure due to Churg-Strauss syndrome, which he had been battling for eight years. ^ a b c Jacob Churg; Lotte Strauss (March–April 1951). "Allergic granulomatosis, allergic angiitis, and periarteritis nodosa". The American Journal of Pathology. 27 (2): 277–301. PMC 1937314. PMID 14819261. ^ Montesi, Sydney B.; Nance, John W.; Harris, R. Scott; Mark, Eugene J. (2016-06-09). "Case 17-2016 — A 60-Year-Old Woman with Increasing Dyspnea". New England Journal of Medicine. 374 (23): 2269–2279. doi:10.1056/NEJMcpc1516452. ISSN 0028-4793. PMID 27276565. ^ a b Della Rossa A, Baldini C, Tavoni A, et al. (November 2002). "Churg-Strauss syndrome: clinical and serological features of 19 patients from a single Italian centre". Rheumatology. Oxford. 41 (11): 1286–94. doi:10.1093/rheumatology/41.11.1286. PMID 12422002. ^ Masi AT, Hunder GG, Lie JT, et al. (August 1990). "The American College of Rheumatology 1990 criteria for the classification of Churg-Strauss syndrome (allergic granulomatosis and angiitis)". Arthritis & Rheumatism. 33 (8): 1094–100. doi:10.1002/art.1780330806. PMID 2202307. ^ Guillevin L, Lhote F, Gayraud M, et al. (1996). "Prognostic factors in polyarteritis nodosa and Churg-Strauss syndrome. A prospective study in 342 patients". Medicine. Baltimore. 75 (1): 17–28. doi:10.1097/00005792-199601000-00003. PMID 8569467. ^ Bosch X, Guilabert A, Espinosa G, Mirapeix E (2007). "Treatment of antineutrophil cytoplasmic antibody-associated vasculitis: a systematic review". JAMA. 298 (6): 655–69. doi:10.1001/jama.298.6.655. PMID 17684188. ^ a b "Press Announcements - FDA approves first drug for Eosinophilic Granulomatosis with Polyangiitis, a rare disease formerly known as the Churg-Strauss Syndrome". www.fda.gov. FDA. Retrieved 13 December 2017. ^ a b c Hellmich B, Ehlers S, Csernok E, Gross WL (2003). "Update on the pathogenesis of Churg-Strauss syndrome". Clinical and Experimental Rheumatology. 21 (6 Suppl 32): S69–77. PMID 14740430. ^ "WikiLeaks: Yar'Adua Died Of Lung Cancer And Churg Strauss Syndrome, US Cables Confirm". Sahara Reporters. 2 September 2011. Retrieved 30 June 2013. ^ "Japan's Taku Takeuchi overcame illness to win Olympic medal - 'I thought I might even die'". ^ "New Zealand responds to Toni Street's illness with love and support". Stuff.co.nz. Retrieved 5 October 2015. ^ "Toni Street reveals 'dark moments' as she battles deadly disease". NZ Herald. Retrieved 5 October 2015. ^ "Toni Street's mystery illness revealed". NZ Herald. Retrieved 5 October 2015. ^ Bolch, Ben (November 25, 2018). "Former UCLA great and integration pioneer Willie Naulls dies at 84". Los Angeles Times. Retrieved November 26, 2018.